ICH Blog: What is in your pancake? What is in your pancake? Mardi Gras literally means "Fat Tuesday" in French. The day is also known as Shrove Tuesday (from "to shrive," or hear confessions) or Pancake Tuesday. The custom of making pancakes comes from the need to use up fat, eggs and dairy before the fasting and abstinence of Lent begins. On Shrove Tuesday, Catholics were encouraged to confess their sins so that they were forgiven before the season of Lent began. To shrive someone, in old-fashioned English (he shrives, he shrove, he has shriven or he shrives), is to hear his acknowledgement of his sins, to assure him of God's forgiveness, and to give him appropriate spiritual advice. The term survives today in ordinary usage in the expression "short shrift". To give someone short shrift is to pay very little attention to his excuses or problems. The longer expression is, "to give him short shrift and a long rope," which formerly meant to hang a criminal with a minimum of delay. WHAT IS IN THAT PANCAKE? Pancakes were a simple way to use these foods, and one that could entertain the family. Objects with symbolic value are cooked in the pancakes, and those who eat them, especially children, take part discovering what their future will be as part of the meal. The person who receives each item interprets the gift according to the tradition: a coin means the person finding it will be rich; the thimble finder will be a seamstress or tailor, a pencil stub means he/she will be a teacher; a holy medal means they will join a religious order; a nail that they will be (or marry) a carpenter, and so on. 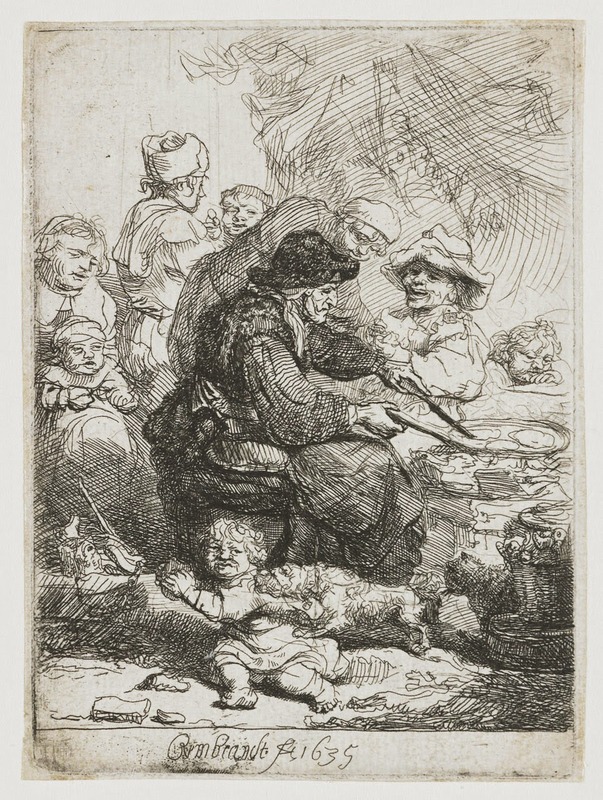 image: The pancake woman, Rembrandt, 1635.